The 2016 Atlanta Falcons season is the franchise's 51st season in the National Football League and the second under head coach Dan Quinn. It will also mark the team's 25th and final season playing their home games at the Georgia Dome, as the Falcons will move into the new Mercedes-Benz Stadium in 2017. The Falcons preseason opponents and schedule were announced on April, 7, 2016, the opponents being the Washington Redskins, Cleveland Browns, Miami Dolphins and the Jacksonville Jaguars. The Atlanta Falcons' final regular season game at the Georgia Dome Week 17. TB – 9:52 Roberto Aguayo 43-yard FG. ATL – 7:08 Matt Bryant 34-yard FG. ATL – 0:11 Mohamed Sanu 5-yard TD pass from Matt Ryan, Matt Bryant kick. TB – 10:25 Brandon Myers 4-yard TD pass from Jameis Winston, Roberto Aguayo kick. ATL – 1:45 Matt Bryant 34-yard FG. TB – 0:14 Charles Sims 23-yard TD pass from Jameis Winston, Roberto Aguayo kick. TB – 12:54 Austin Seferian-Jenkins 30-yard TD pass from Jameis Winston, Roberto Aguayo kick. TB – 5:12 Mike Evans 45-yard TD pass from Jameis Winston, Roberto Aguayo kick. ATL – 1:35 Julio Jones 25-yard TD pass from Matt Ryan, Matt Ryan pass to Mohamed Sanu for two-point conversion. ATL – 4:55 Matt Bryant 29-yard FG. ATL – 11:58 Matt Bryant 21-yard FG. OAK – 7:51 Latavius Murray 1-yard TD run, Sebastian Janikowski kick. ATL – 4:46 Julio Jones 21-yard TD pass from Matt Ryan, Matt Bryant kick. ATL – 0:38 Matt Bryant 20-yard FG. OAK – 11:17 Clive Walford 31-yard TD pass from Derek Carr, Sebastian Janikowski kick. ATL – 3:42 Jacob Tamme 14-yard TD pass from Matt Ryan, Matt Ryan run for two-point conversion. OAK – 12:00 Michael Crabtree 2-yard TD pass from Derek Carr, Sebastian Janikowski kick. ATL – 9:29 Justin Hardy 8-yard TD pass from Matt Ryan, Matt Bryant kick. ATL – 4:35 Tevin Coleman 1-yard TD run, Matt Bryant kick. OAK – 2:12 Andre Holmes 6-yard TD pass from Derek Carr, Sebastian Janikowski kick. NO – 8:25 Coby Fleener 2-yard TD pass from Drew Brees, Wil Lutz kick. ATL – 5:21 Tevin Coleman 2-yard TD run, Matt Bryant kick. ATL – 14:53 Devonta Freeman 13-yard TD pass from Matt Ryan, Matt Bryant kick. NO – 9:55 Michael Thomas 3-yard TD pass from Drew Brees, Wil Lutz kick. ATL – 5:31 Tevin Coleman 2-yard TD run, Matt Bryant kick. ATL – 0:28 Justin Hardy 4-yard TD pass from Matt Ryan, Matt Bryant kick. NO – 0:00 Wil Lutz 57-yard FG. ATL – 12:03 Tevin Coleman 6-yard TD run, Matt Bryant kick. NO – 7:38 John Kuhn 3-yard TD run, Mark Ingram run for two-point conversion. ATL – 2:58 Matt Bryant 21-yard FG. ATL – 13:37 Deion Jones 90-yard interception return TD, Matt Bryant kick. NO – 10:00 Mark Ingram 5-yard TD pass from Drew Brees, Wil Lutz kick. 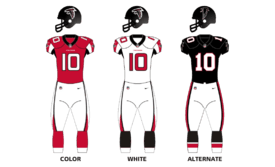 The Falcons wore their black throwbacks uniforms for this game. With the game tied at 30-30, a missed 58-yarder by Matt Bryant forced the game into overtime. The Falcons received the ball first in overtime but turned the ball over on downs after failing to convert a fourth down. Then Josh Lambo silenced the Georgia Dome crowd by nailing a 42-yard field goal in overtime to seal a 33-30 victory for the Chargers. Despite Mike Evans finishing the game with 11 receptions for 150 yards and two scores, the Falcons still managed to blowout Tampa Bay on the road, 43-28 in order to go to 6-3. Falcons fans, who attended the game chanted "M-V-P!" after Matt Ryan's four-touchdown performance.